Consumers’ contribution to economic growth shows signs of slowing as retail sales dipped for the third consecutive month, a surprising trend that has not occurred in nearly four years. Core retail sales remain at healthy levels, 8 percent higher than their pre-recession peak, but the pattern of monthly declines implies a growing hesitancy on the part of consumers and correspondingly lower confidence. Consumer confidence fell three points in July, on the heels of a 6.5 point plunge in June, to the lowest level recorded this year. In addition, the cooling labor market and slower wage gains reflect a corporate bias toward caution in response to lower growth expectations and uncertainty. 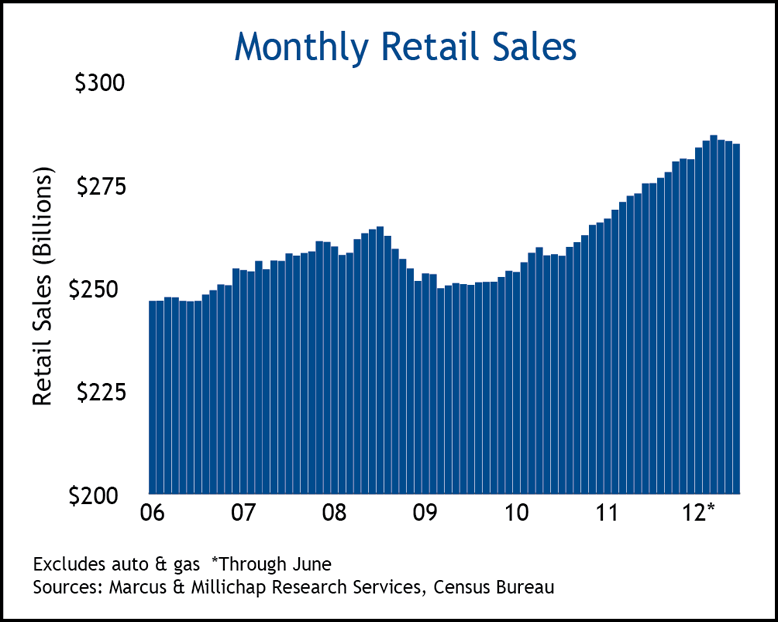 June retail sales totaled $401.5 billion, representing a 0.5 percent monthly decline from May, but they remain 3.8 percent above year-ago levels. Core retail sales, which excludes the highly volatile auto and gasoline segments, declined by 0.2 percent for the month, but also exceeded last year’s figures by 3.5 percent. Nonstore retailers, dominated by online stores, represented a bright spot, achieving 0.5 percent growth over the last month. Food and beverage stores, and clothing and accessories stores also garnered modest monthly gains in June. All other categories posted declines for the month. Led by building materials and supplies, and the sporting goods, music and bookstore category, both of which declined 1.6 percent. Despite the downward monthly trend, most retail components remain at least 5 percent ahead of last year, with only department stores and electronics and appliance stores reporting annual revenue declines of 3.2 and 1.0 percent, respectively. The loss of momentum in the labor markets, flattening trajectory of wage growth, and economic and political uncertainty appears to have ushered in the second quarter’s downward trend in consumer spending. Although energy prices fell 4.6 percent in May, boosting disposable income, expenditures weakened as consumers increased the personal savings rate by 3.9 percent instead. Wages and salaries, which account for more than half of income, flattened in May following a substantial increase in April. The downturn in several economic indicators that influence demand for industrial properties, such as retail sales and production, could eventually constrain demand for industrial space. Thus far, however, the sector has maintained good momentum with dwindling vacancy aided by low levels of new supply. Vacancy is forecast to tighten to 11 percent by year end. Looking forward, pending legislation with bi-partisan support that allows states to tax online retailers would effectively eliminate ecommerce site’s 5 to 10 percent pricing advantage over brick-and-mortar retailers. Consumers would absorb higher prices, but the tax would contribute significant revenues to state coffers. To regain a competitive advantage, Amazon, and likely its online rivals, plans to offer same-day delivery, which requires more strategically located warehouses across the country. The downsized formats, renovations, and selective openings and closings by department stores struggling to remain relevant are indicative of the annualized declines in department store receipts. Net new demand for retail space remains limited, but the decline in the national vacancy rate owes more to the dearth of new supply, expected to total 32 million square feet by year end. Forward projections call for a further decline in vacancy to 9.2 percent by year end. This entry was written by marcusmillichap, posted on July 18, 2012 at 11:53 pm, filed under Research and tagged consumer spending, retail. Bookmark the permalink. Follow any comments here with the RSS feed for this post. Post a comment or leave a trackback: Trackback URL. check again here frequently. I’m quite sure I will learn many new stuff right here! Best of luck for the next! the internet. I’m going to recommend this blog! like it like that before. You make it sound so alluring. I am going to have to inquire about this more! Excellent post. I am experiencing many of these issues as well. I’d like to thank you for the efforts you have put in writing this site. I’m hoping to check out the same high-grade content from you later on as well. I’m psyched to see a new update, I was going through irrational distress! I have a ball reading your stuff, I can’t get enough of it! True, but entertaining, as are many of your pages. I read through the archives over the past week, and I must say I think I’m in love. Hi mates, pleasant paragraph and good urging commented here, I am actually enjoying by these. Hi, I desire to subscribe for this website to take most up-to-date updates, so where can i do it please assist.